The PORSCHE-DIESEL Registry for North America was founded in summer of 2002. With the help of Porsche AG and Porsche Cars of North America the PORSCHE-DIESEL Register was incorporated into the Porsche Club of North America Register Group. The PORSCHE-DIESEL Registry was established with the objective to maintain and preserve the PORSCHE-DIESEL tractors and their unique history in North America. Its purpose is mainly to support members with technical, repair, maintenance, and restoration questions. 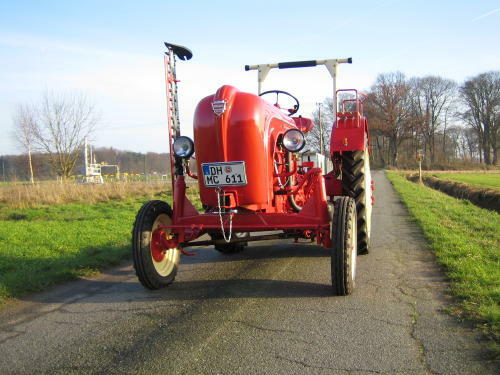 In the future, we also would like to support and encourage members to participate in tractor rallies, tractor pulls, concourse exhibitions and local social events to promote and preserve these classic and unique tractors. The PORSCHE-DIESEL Registry encourages members to exchange technical experiences and offer help to each other, as well as practical hints in questions about restoration. The PORSCHE-DIESEL Registry now already has over 60 members owning together over 300 PORSCHE-DIESEL tractors of all models ever built. This is a fast growing club and easy to join. If you are a PCA member, just sign up at the “Member’s” section. If you are not a member of the PCA, just contact one of the officers, and we will guide you through the process of joining. We're working to offer a fantastic site including pictures, historical information, comments from members, new member registration, and more. Please enjoy and don't hesitate to contact us with questions or suggestions for improvement!